There's something about watching classic movies that is warm and comforting, especially around the holidays. Our family Christmas day tradition is to settle in together and watch a favorite classic movie. 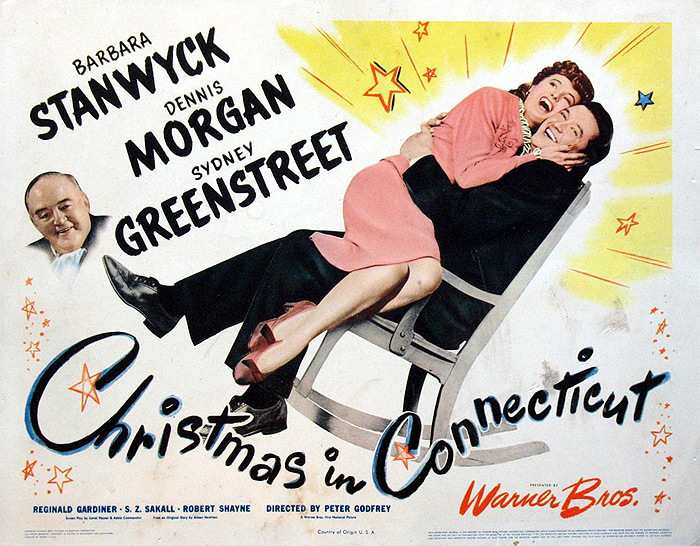 This year the movie of choice is Christmas in Connecticut; a romantic comedy about a famous food writer that has lied about knowing how to cook, when in reality she can't boil an egg. When put to the test and asked to host Christmas dinner, she must cover up her deception or risk losing her job. She almost pulls this off until she unexpectedly falls in love with one of her guests. There are a lot of food scenes in this film, but Christmas dinner is the highlight. 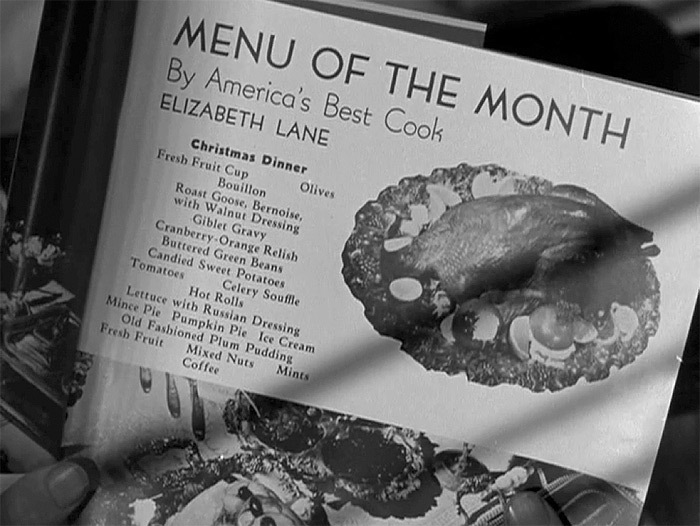 The main character, Elizabeth Lane, puts together a delicious menu. I thought about recreating the entire meal but realized a lot of it I have made before in one form or another. Though there was one menu item I thought stood out, the Celery Souffle. For this month's Dinner In A Movie I decided to give this classic celery dish a try. 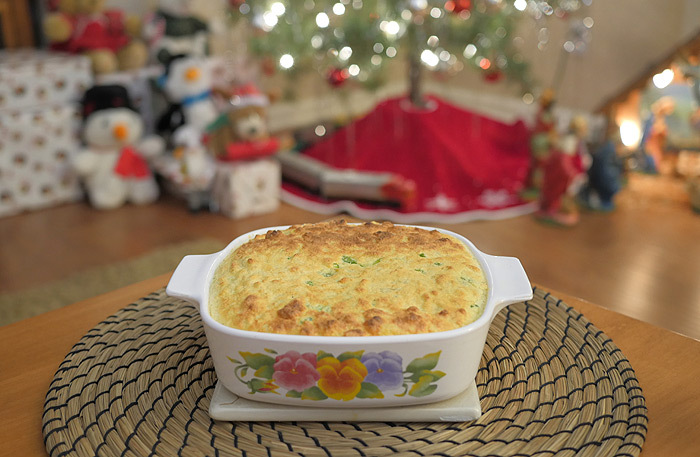 Similar in taste and texture to stuffing, the celery souffle is an elegant, easy to make side dish that goes well with roasted chicken, or like Elizabeth's menu suggests with goose. Cut the bread into small cubes and soften in the milk. Melt the butter in a skillet. Add the celery and onion and cook for 3 minutes. Add the bread and milk and beat until smooth. Remove from the heat. Beat the egg yolks and add to the celery mixture, stirring until combined. Beat the egg whites in a separate bowl until stiff and fold into the celery mixture. Pour into a well-buttered 1-quart casserole, set in a pan of hot water, and bake at 375 degrees F for 30 minutes. What a fun idea to recreate the dish! Well, Elizabeth Lane couldn't cook worth a darn in the movie. All the great recipes came from Felix! I've never heard of celery souffle, but now I have to try it! I love movie nights! We do them quite often. Great post! Celery is such an underrated vegetable. Great idea! I love your re-creating an old school recipe from an old-school movie. Looks pretty easy to make too! love movie nights, so fun. How fun. That celery souffle sounds interesting! Oh my gosh, I love movies that had lot of food in them like this. Love your Christmas day tradition! We might have to try that next year! Great pick on the Souffle. This is one of my favorite movies to watch during Christmastime (and I've created a post based around it, too). Loving this retro celery souffle - so fun! What a fun tradition! Definitely trying this dish; so simple. Oh that celery souffle looks amazing! Celery souffle sounds very interesting! And now I'll have to look up the movie too! Oh that is a super interesting recipe! Very fun! Merry Christmas! oh fun! That souffle looks yummy. I need to watch that film, it sounds awesome. Great recipe, I've never heard of a celery souffle. How fun! I haven't had a soufflé in so long. Now I'm craving one. Sounds so good. I love Christmas in Connecticut! This souffle looks pretty delicious too! I've never heard of celery soufflé, but sounds interesting. Love your retro baking dish too!! Thanks for linking up at the Let's Get Real Weekly Link Party #122. I adored reading this post! Loved it so much I came back for a second look! I'm not familiar w/ that movie but it sounds fun. I've also never heard of this recipe so you are just full of new info for me today, thanks!